World slalom queen Mikaela Shiffrin, 18, of Eagle-Vail, Co. dominated the Audi FIS Alpine World Cup opening slalom with a wire-to-wire victory Nov. 16 at Levi, Finland to notch the fifth World Cup win of her young career. Shiffrin was the only athlete in the field to post two sub 58-second runs. She bested 2010 Olympic champion Maria Hoefl-Riesch of Germany by a massive 1.06 seconds and reign-ing World Cup overall cham-pion Tina Maze by 1.61 seconds. In addition to prize money and 100 points toward the World Cup overall and slalom standings, Shiffrin was awarded an authentic Lapland reindeer by the Levi organizing committee. She will name her reindeer, and will be able to follow her reindeer’s movements and adventures in Lapland during winter via pictures and social media. The prize reindeer, young from last spring, has been raised by Johanna Hietanen from Ounaskievari Reindeer Farm. In only her third season on the World Cup tour, Shiffrin is already third among American women for career slalom wins. Former overall champion Tamara McKinney has nine and Kristina Koznick six. Shiffrin, who was sixth to open the season at the Soelden giant slalom, has now won five of the last eight World Cup sla-loms. After two races she leads the World Cup overall stand-ings 140-100 over Lara Gut of Switzerland, who won Octo-ber’s giant slalom in Austria for her first career victory. 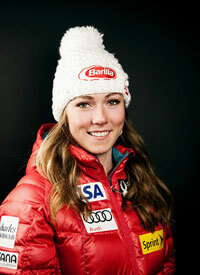 Shiffrin placed sixth in the Oct. 26 GS at Soelden for 40 points. Shiffrin’s win matches her with American Lindsey Vonn as the only other American to have won in Levi. America is now the only nation with mul-tiple victories at the Finnish resort. On Nov. 17 at Levi, Ted Li-gety, 29, of Park City, Utah fin-ished a respectable 11th in the season-opening men’s slalom in Finland. Race winner was Aus-tria’s Marcel Hirscher, last winter’s overall and slalom champion who posted his 10th consecutive World Cup slalom podium result. Ligety had debuted the 2013-14 season with a historic .79-second giant slalom triumph Oct. 27 at Soelden, Austria for his 18th World Cup career win. He is first man to win three World Cup GS races in a row at Soelden. Hirscher leads the current World Cup standings 160-124 over Ligety after two events. Next: The men’s World Cup visits Lake Louise, Alberta, Canada for downhill and super giant slalom races Nov. 29-Dec. 1. And the women's World Cup tour now rolls to North Amer-ica for a downhill, super G and giant slalom Thanksgiving Weekend at Beaver Creek, Co.—host of the 2015 FIS Alpine World Ski Championships. Olympic gold medalist and 16-time Audi FIS Alpine World Cup title winner Lindsey Vonn, 29, of Vail, Co. announced Fri-day, Nov. 22 that she will not compete during the Nov. 29-Dec. 1 Nature Valley Raptor women’s World Cup race event at Beaver Creek, Co.
Vonn sustained injuries as a result of a downhill training fall Nov. 19 on the U.S. Ski Team Speed Center at Copper Mountain. While Vonn’s rehab is progressing, she is not at a point where she will be able to ski next week, the ski team an-nounced on its Web site. The U.S. Ski Team’s Best in the World women’s speed team will test the full length Raptor course to be used for next sea-son’s World Championships with racing Nov. 29-Dec. 1 in Beaver Creek. The event will be televised on NBC and NBC Sports Network. American women due to race in the opening speed races of the 2014 Olympic season in-clude Julia Mancuso of Squaw Valley, Ca., Stacey Cook of Mammoth Mountain, Ca., Leanne Smith of N. Conway, N.H. and Laurenne Ross or Bend, Ore. Following the Nature Valley Raptor races in Beaver Creek, World Cup women head to Lake Louise, AB, for downhill and super G racing Dec. 6-8.